The unlikely bond between President Trump and French President Emmanuel Macron — once dubbed Le Bromance by the New York Times — appears to have taken a turn for the worse following Trump's weekend visit to France. Driving the news: Trump kicked off the trip by tweeting his frustration with Macron's proposal for a "true European army," calling the idea "very insulting." On Sunday, with Trump sitting nearby, Macron gave a speech slamming nationalism as "a betrayal of patriotism." Trump responded in a Tuesday morning tweet storm, pointing out Macron's low approval rating and claiming "there is no country more [n]ationalist than France." Flashback: Things weren't always this tense. Trump hosted Macron for his administration's first official state dinner in April. It was a jovial affair marked by affectionate body language and a belief that while the leaders differed widely on matters of policy, their strong personal relationship would allow them to work together constructively. As Axios' Jonathan Swan noted, Trump views international relations as chemistry between individuals — and Macron, perhaps more than any other leader, put forth "a master class" in flattery and attentiveness to, paired with wariness of, the president. On the last evening of his visit, Macron held a postgame with reporters in which he had this blunt assessment of Trump's "America First" approach: "It can work [in] the short term, but it's very insane [in] the mid- to long-term." Such statements fit with Macron's ambitions "to be a strong leader that Trump disagrees with but respects for being strong,” Célia Belin of Brookings says. Macron continued to charm Trump in person before turning around and bashing everything he stands for. For a while it seemed to work, even if it yielded limited tangible results. 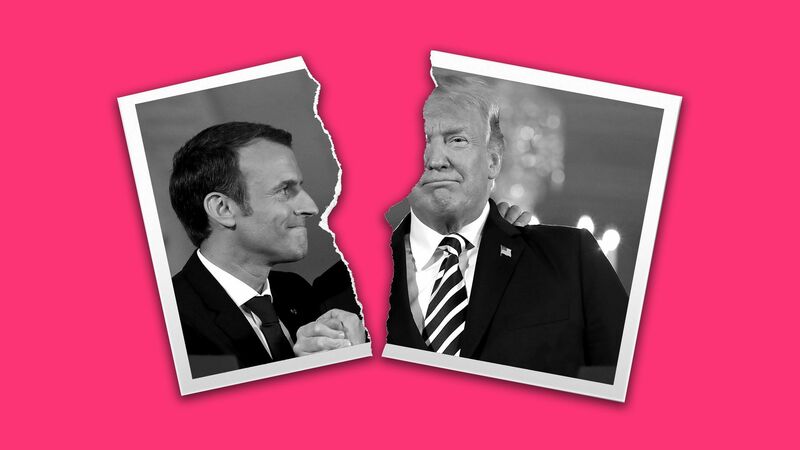 When the divide between Trump's nationalism and Macron's multilateralism began to manifest in concrete policy, though, as with Trump's unilateral withdrawal from the Iran deal and implementation of steel and aluminum tariffs, Macron did not hesitate to voice his displeasure. The NATO summit in July, during which Trump made veiled threats to withdraw from the alliance unless other countries boosted their defense spending, marked a turning point. The next month, Macron announced an "exhaustive review" of defense cooperation in the EU and claimed the bloc can no longer rely on the U.S. for its security — a position he continues to espouse. The big picture: Macron is dealing with his own problems in France and in Europe, including a battle with right-wing populists that are de facto allies of Trump's. His confrontation with the likes of Viktor Orban in Hungary and Matteo Salvini in Italy would be difficult to square with amity toward Trump. Go deeper: In Macron's battle for Europe, Trump is a foe.